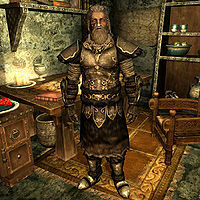 Kodlak Whitemane was a Nord warrior and a well-respected Harbinger of the Companions. He avoided politics, and maintained the Companions' long-standing tradition of abstaining from political conflicts during the Stormcloak Rebellion (although he did worship Talos). He was also something of a philosopher, prone to pondering on the meaning of honor and nobility. He lost his family at a young age, when he was little more than a boy. His predecessor, the Harbinger Askar, found him working as a bodyguard in Hammerfell, and recruited him. The Companions quickly became his new family. As Harbinger, he maintained that family and honor are the most important things to the Companions, and that they should deal with problems head-on, finding honor in life through glory in battle. Legends of the Companions speak of Kodlak's many great feats, such as Kodlak and another Companion fighting off one hundred and one Orc berserkers. As a member of the Circle, Kodlak was a werewolf, something that troubled him greatly during his twilight years. He was led to believe that, upon death, a werewolf's soul goes to the Hunting Grounds, the Daedric realm of Hircine. As a Nord, Kodlak wanted his soul to go to Sovngarde. His dreams became visions where he realized he had a choice, to either join the hunts of Hircine or join Tsun in Sovngarde. The dreams also told him this choice would hinge upon a stranger, one who he eventually met in 4E 201. They rarely spoke, which Kodlak regretted, but he was still impressed by the newcomer's prowess and fortitude, and chose the new Companion as his successor before he was killed by the Silver Hand. Shortly after his death, the Circle successfully found a cure for the Companions' lycanthropy, and cleansed Kodlak's spirit so he could make his way to Sovngarde. However, his soul was blocked from entering the Hall of Valor by Alduin's soul snare, and he was hunted by the World-Eater like prey. He eventually found his way to Shor's hall after Alduin was defeated. ^ a b c d e Events of Skyrim.